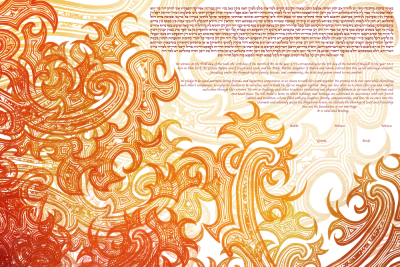 The bright orange swirls of the Swirls Ketubah recall distantly art nouveau — and more directly fire and excitement, falling autumn leaves, a exciting rebirth of the cycles of life that have come before it. Above all, we are overwhelmingly proud of this Ketubah because it is This Is Not A Ketubah’s very first Ketubah — so, as our style changes and grows, we remember our first, and most powerful, Ketubah–and the fire that stems from it. All Ketubot are Limited Editions of 500 each, and optionally include a Certificate of Authenticity. What Material Should We Create Your Ketubah On? Read About Our Material Options! If your wedding is within 3 weeks, call or email us now! *Our lawyers insist we add: certain options cost more, so check our options & prices. FedEx shipping included only for domestic USA, non-rush orders.